The island Maui is perhaps the ultimate tourist resort, with spectacular ocean views, superb facilities and endless white-sandy beaches, with the main tourist areas being Lahaina, Kaanapali, and the Kihei Strip on the west side of Maui. Maui's warm coastal waters attract humpback whales and a host of other wildlife, and Maui is known throughout the world for being a major location for whale watching. Other attractions around Maui include superb windsurfing and water sports facilities, two enormous mountains, a scenic road to Hana, tropical gardens and national parks. 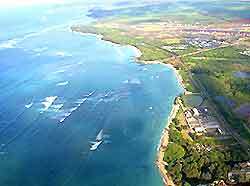 Maui was the first major development outside of Waikiki and Honolulu, on nearby Oahu, and is close to the neighboring Hawaiian islands of Lanai, Molokai and Kahoolawe. Tourism has become an important way of life on the island of Maui, regularly attracting tourists from all over the world, for relaxing vacations and also tropical weddings. This island's main tourist information center is the Maui Visitors Bureau, which is situated in Wailuku. Offering a range of tourism information, brochures about tourist attractions, opening times, admissions and maps of the island, indepth tourist information and magazines are also often available in the reception areas of many hotels. Hotels in Maui vary greatly, with some of the island's most popular hotels offering superb ocean views. The main resorts on Maui include Hana, Kaanapali, Kahului, Kapalua, Kihei, Lahaina, Lahaina, Maalaea, Makena, Wailea and Wailuku, all of which offer a range of accommodation to suit all budgets. 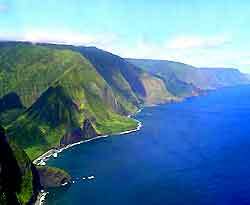 Hotels are particularly concentrated on the west side of Maui, from Lahaina to Kapalua, and on the east side, including Kilei and Makena. 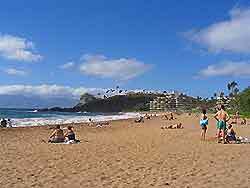 More information about Maui Hotels and Villas. The property market on Maui has remained relatively stable in recent years, thanks to its gorgeous beaches and buoyant tourism industry. Many of the rental properties enjoy beachfront situations, with the communities of Kahului, Kapalua and Kihei all having much to offer island visitors and holiday makers. The Maui real estatemarket is especially concentrated along the western coastline, where both apartments and condos are in good supply, to rent or for purchase. Maui contains numerous tourist attractions, including the Maui Ocean Center - one of the island's top attractions, with live coral displays, giant sea turtles and sharks; Hale Kahiko - a replica Hawaiian village featuring traditional thatched buildings; the Maui Tropical Plantation - a vast working plantation with crops such as bananas and sugar cane; the Garden of Eden Arboretum and Botanical Gardens - famous for being using in the opening sequence of the Jurassic Park movie; and Maui's Kula Botanical Gardens - with more than 2,000 indigenous flora and fauna. Further main tourist attractions in Maui include Black Rock - a striking natural landmark formed from lava with superb snorkeling; Blue Angel Falls / Helele'ike'oha Falls - including the sparkling deep pool known as Maui's Blue Pool; Wo Hing Temple - an eye-catching temple filled with historic information about Lahaina's Chinese community; Ka'eleku Caverns - ancient underground caves with popular guided tours; Old Lahaina Prison - a small and uncomfortable Maui prison, dating back to the 1850s; Maui's Iao Needle - a giant rock pinnacle towering above the Iao Stream and volcano crater; Banyan Tree Park - with one of the world's largest Indian Banyan trees; and Haleakala Crater - rising high above the sea level. 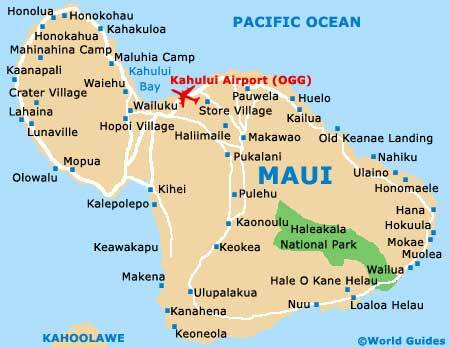 More information about Maui Tourist Attractions and Maui Landmarks. Some of Maui's best museums and art galleries include the Carthaginian II - a floating museum and authentic replica of the original 19th-century Carthaginian ship; the Alexander and Baldwin Sugar Museum - with extensive displays and information about historic sugar plantation life; the Bailey House Museum - located in Wailuku, with many important Hawaiian and Maui artifacts; Lahaina Heritage Museum - celebrating the Lahaina area's rich history and culture; Whalers Village Museum - full of information and artifacts about Maui's historic whaling days; and the Maui Crafts Guild - showcasing work by local artists and craftspeople. More information about Maui Museums and Maui Art Galleries. Tourist attractions near to Maui include Oheo Gulch - a series of impressive waterfalls and pools, also referred to as the Seven Sacred Pools; Haleakala Highway - a popular drive, with steep roads and spectacular Maui views; the Sugar Cane Train - transporting visitors on a picturesque journey through some of Maui's most spectacular countryside; Hana Cultural Center - with indepth information about Hana's cultural heritage; the Tedeschi Vineyards and Winery - a scenic winery situated on picturesque volcano slopes; and Kaanapali Beach - a magnificent public beach boasting endless stretches of golden sands and clear waters. More information about Maui Attractions Nearby.